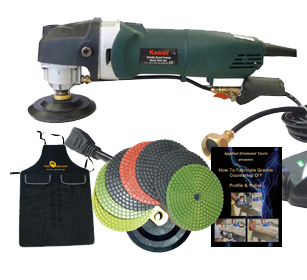 This package is designed for fabricators, contractors or DIYers to start wet polishing granite or concrete with limited budget. a 4" or 5" back holder. a free DVD on how to profile and polish granite edges. This package is ideal for polishing straight edges of granite, marble and also good for polishing concrete countertops. Use 4" wet pads for polishing edges and 4" or 5" wet pads for polishing concrete countertops. This package has one of the best values in our store. *If you choose the basic 4" JHX wet diamond polishing pads, a buff pad is not included and you will not need to choose the buff pad. I think it is a great value for the money. I do recommend getting the buff pad when ordering this kit to get the gloss shine you are looking for. The tool itself works great, but a little heavy. You do have to be aware of the water that gets on the tool after all it is electric. If your hand is on the metal you will feel an electrical tingle. Keep the back of the tool dry. In 3 hours of use felt the tingle two times. This kit is a great value for the money.